As you most likely know, Visual Studio 2017 was launched on March 7 with many great new features. In a recent Q&A, Microsoft Technical Evangelist for Developer Experience Robert Green says that his two favorite new features are the Lightweight Solution Load and the custom code style configuration. Let's look at each of those features. Do you ever wish that loading your solution took less time? It seems absurd to have to wait as long as you do when you only need to access one project. With Visual Studio 2017's Lightweight Solution Load, you can load a solution without fully loading all of the projects. With this feature turned on, you don't need to have every project fully loaded in order to do things such as navigate through the code, build the solution, or make code changes across projects. The projects load as needed, so this saves a ton of time, especially with more complex solutions. The Visual Studio blog details some of the load performance here: https://blogs.msdn.microsoft.com/visualstudio/2016/10/11/shorter-solution-load-time-in-visual-studio-15/ The gains in productivity should be significant if you don't generally need to load all of the projects. The only downside is the potential for the unloaded projects loading later on, but that doesn't seem like a big enough negative to warrant not using the feature. To enable Lightweight Solution Load globally, go to Tools -> Options -> Projects and Solutions -> General. 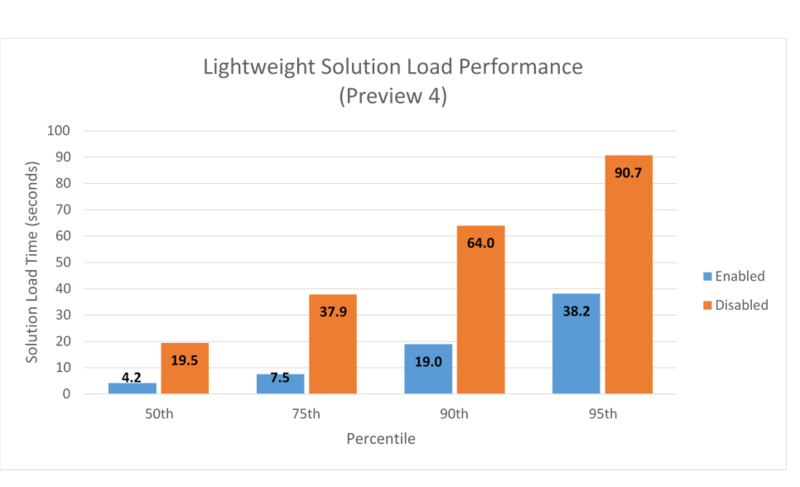 Check Lightweight Solution Load.